Led by a Lumpkin County Sheriffs Office deputy and a truck proclaiming “Wide Load,” two duplexes formerly belonging to the University of North Georgia cross Georgia 400 on their way to Red Oak Flats. They will become transitional housing for the county’s homeless families once they are set up at their new home on Red Oak Flats Road. 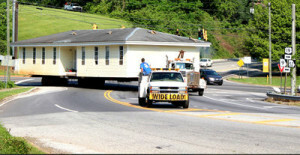 Four duplex homes were loaded onto steel I-beams and trundled out of Dahlonega to property on Red Oak Flats Road recently. The move represents the latest, and perhaps biggest step in North Georgia Interfaith Ministries’ (NGIM) goal of providing temporary housing for Lumpkin County’s homeless. The local initiative has been moving forward since December 2013 when a group of 21 people from several Dahlonega churches came together to explore ways to help the county’s homeless. The group has since grown considerably, incorporated and become a 501c3, and worked to provide services to the homeless while searching for ways to provide much-needed housing. That goal was reached after NGIM Chair Jimmy Faulkner approached the University of North Georgia after hearing they would be building a new dorm and needed to do something with four duplexes, formerly faculty housing, then on the property. “The University of North Georgia was delighted to help InterFaith Ministries provide a much-needed service to our community,” McConnell said. There are others that need to be thanked for their part in the project, Faulkner said. “Mr. Hoyt Robinson for the the donation of two acres of land on which to relocate the duplexes; Corvias Campus Living; UNG Director of Facilities and Operations Todd Bermann who was an outstanding help in getting the buildings moved; an anonymous local donor for donating the funds to cover the cost of relocating the duplexes; and numerous local businesses and individuals who have made significant donations of time and money to the ministry,” he said. The houses are on site and most of the work needed to make them livable has already been arranged. Even the furnishings have already been promised, from furniture to dishes, cookware, towels, bedding and everything else needed to furnish a home. The group is currently working on developing a program for the transitional housing—counseling in life skills, help with seeking employment where needed, helping them find community resources for social services and other services to help families get on their feet. They will also be interviewing for a program manager and a resident manager—both paid positions.